Last updated February 13th, 2019. We’ve all heard about China’s immense growth over the past several decades. They surpassed Japan to become the world’s second largest economy back in 2010. India arguably boasts greater investment potential, despite getting far less international news coverage. Many economists believe India’s economic rise will tread a path similar to China’s. Others even think India will outperform their eastern neighbor, and the United States, over a long period of time to eventually become Earth’s biggest economy. 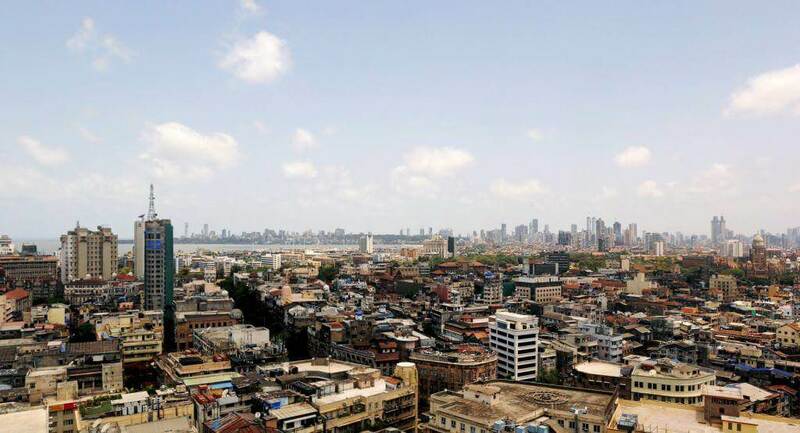 For example, analysts at Citibank say that India will leap from its current spot at number seven, surpassing the GDP of every other nation on the planet by around the middle of this century. It’s impossible to predict exactly what will happen 60 years from now. Countless economic and political changes have occurred since the 1960s that nobody from back then could imagine. So you’d be correct to view such a claim with a healthy amount of skepticism. There are several reasons why India could become the world’s largest economy over a longer-term though. It might not happen anytime soon, but almost surely will before the end of this century. Here’s why. First, India’s population will rise while China’s begins to weaken. Birth rates and life-expectancy aren’t hard to extrapolate over the long-term. Indicators show that India will have a population of nearly 1.7 billion people by 2050, increasing from its current 1.3 billion. India will also have the biggest working age population on the whole planet before 2050. More than 800 billion people in the country will be between the ages of 15 and 64 by that time. This means India will enjoy greater productivity and won’t be affected by an elderly population in need of pensions and social welfare. Meanwhile, China will see a demographic crisis as its population shrinks. It already has among the lowest birth rates in the world and the country’s one child policy is mostly to blame. The one child policy officially ended in 2015 but its effects will prove negative and long-lasting. Chinese couples could only have a single child from 1979 until the policy’s termination. Yet two people must birth at least two children for a population to achieve its replacement rate. Couples who gave birth under the one child policy are just now reaching retirement age. As a result, the elderly dependency ratio is rising. China’s population will then rapidly fall once this generation starts dying about 20 years from now. India doesn’t have the same problem. Their population will increase to a staggering 1.6 billion as China’s declines. 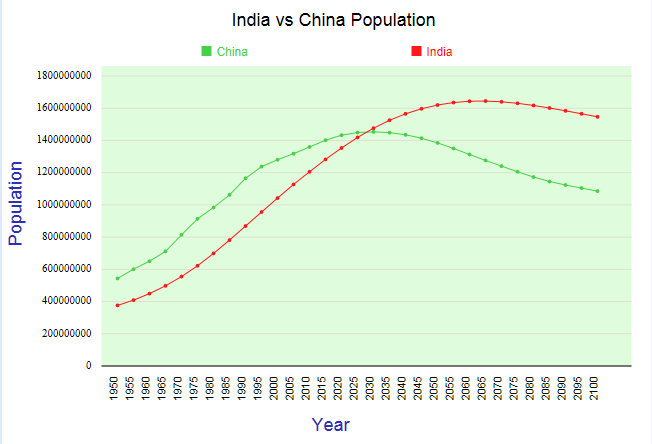 India’s long-term population growth projections compared to China’s. Secondly, India’s economy in general has a lot of room to rise. It grew by 7.1% in 2016 and the World Bank expects an even quicker pace in 2017. A large amount of deregulation is expected by the end of this decade and foreign investment is already booming. Compare India versus China where economic growth is plummeting. The nation’s GDP growth was a healthy 6.7% in 2016 but will only get slower from here. The Chinese demographic crisis explained above hasn’t even truly started yet. Nonetheless, its economy is already showing signs of weakness because of entirely different reasons such as a trade war with the United States and strong competition from Southeast Asian manufacturers. India viewed from space in 1994 alongside a picture taken in 2010. You can easily understand what India accomplished in just under two decades. Unfortunately, investing in India remains very difficult. That’s true whether we’re talking about purchasing real estate, buying stocks, or starting a company. Foreigners cannot own property while running a business in India is bureaucratic to put things lightly. The government intends to make life easier for international companies, or so they say, although any noticeable progress will probably take time. Trading on the stock market is the easiest way you can invest in India – even if you can’t trade directly. Foreign individuals aren’t allowed to purchase India stocks, but institutional investors are permitted. As such, you can buy India ETFs that directly own stocks in India such as the iShares MSCI India ETF (BATS:INDA) through a U.S. brokerage account. Buying shares in an ETF or starting a business in India are really the only two feasible ways you can invest here. Running an Indian company can be a total pain, but that isn’t necessarily a bad thing if you’re willing and capable of putting in some extra work. Regardless, India is positioned for immense growth over the next few decades. The nation isn’t without its challenges but long-term investors may wish to consider investing in India soon. As usual, the early bird gets the worm.